L'incident a eu lieu sur l'aéroport de Gimpo et n'a pas fait de blessés. Les deux appareils, un Boeing 777 de Korean Air et un Airbus 330 Asiana Airlines étaient en cours de remorquage vers les passerelles d'embarquement. 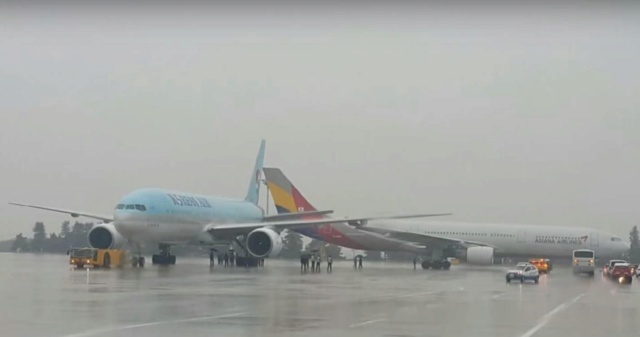 SEOUL - Two airplanes that were being towed collided at an airport in Gimpo in western Seoul, causing damage to part of the jets and a four-hour delay in their take-offs, South Korean authorities said on Tuesday (June 26). 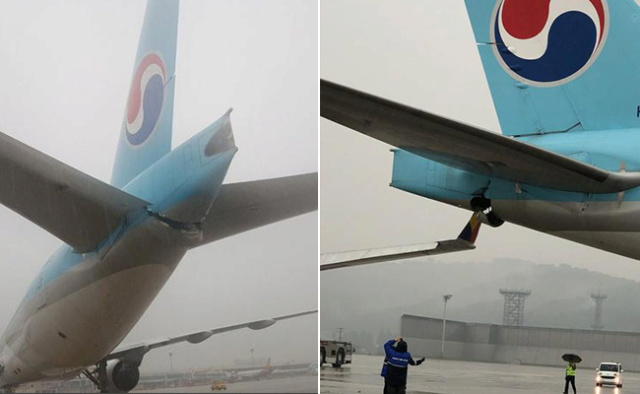 A Boeing 777 Korean Air plane hit its tail against a wing of an Airbus 330 Asiana Airlines plane in the apron of the International Terminal of the Gimpo International Airport at around 8am, reported Yonhap news agency. No passengers were aboard either of the planes when the incident happened, they said. Un sourire qui a un air de ressemblance avec l'A380 AF ....faut dire que c'est la même arme employée: winglet A330 !